Behold! My graduation professional portfolio! It’s amazing how professional the pictures turned out to be. My friends aka models told me how they were told to pose during the photo shoot and how they felt awkward posing. 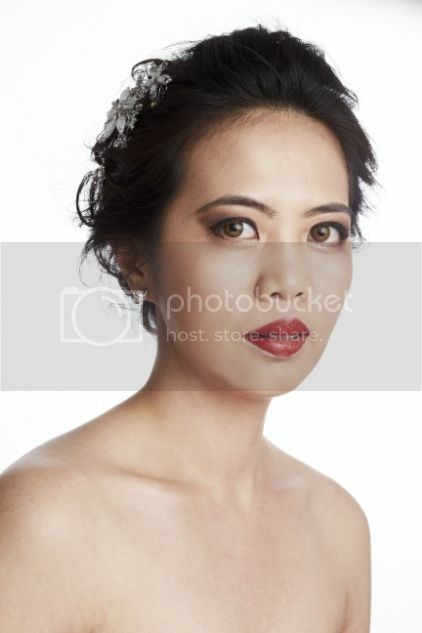 The first picture is Bridal Day Look. My teachers told me that this was a well done job as she looked very fine and neat when they first saw her walking into the photo shoot room. This picture is placed in the first page of my portfolio. Doing a bridal make up is not that tough, but what is tough is she must look beautiful, radiant, attractive and most importantly, she must look like herself still. Karen has short hair (chin level) and there isn’t much hairstyle that I can do except to curl. It was her first time having curly hair and it looks nice, right? 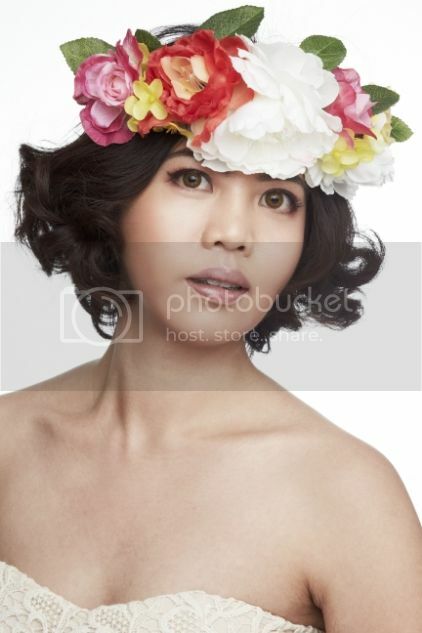 Other than that, I DIY-ed the flower head to create a garden themed wedding. The second picture is Bridal Night Look. I struggled a lot on concealing Pamela‘s eyebrows. When I saw the picture, my heart stopped for a moment. It is what I hate doing most – concealing eyebrows. If thin eyebrows nevermind. But Pam‘s eyebrows are super thick. I was quite disappointed with my works though. But thankfully the picture turned out quite gorgeous. The fourth picture is also a copied look. This one is a Fashion Look. Same thing – concealed eyebrows. And the picture given shows completely NO EYEBROWS seen. 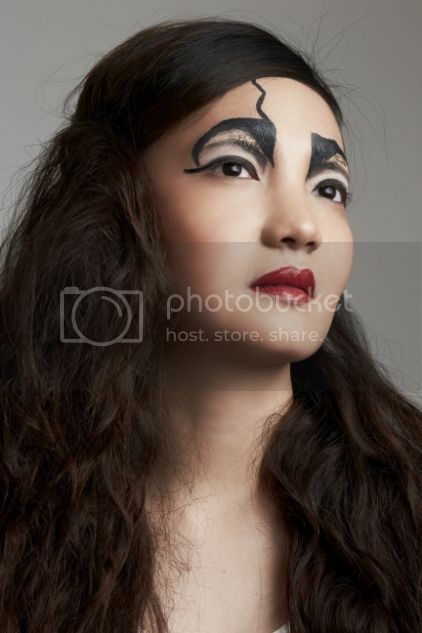 I was devastated lah as I really spent a lot of time concealing her eyebrows. 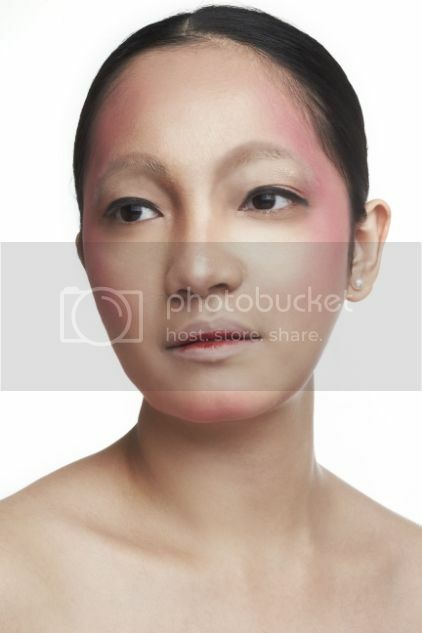 Actually, I re-photoshopped as the photographer left the ugly brows seen. So i removed them so it doesn’t look so awful on my portfolio. Haha. With that ugly improperly concealed eyebrows, I might scare my future clients away. At least this picture looks, acceptable. haha. The fifth picture is a Fashion Look I created. As Aretha has really deep small eyes, I created a simple fashionable look on her. As I know I wouldn’t have much time during the exam to create fanciful looks, I though this will do. Before the exam, we had to do a face chart on our created looks and create it on our models based on what we drew on the face chart. To make the look more fashionable, I did an ombre lips (dark purple and deep maroon colour with a gold sheen on her bottom lips). But somehow it is not really visible in pictures. 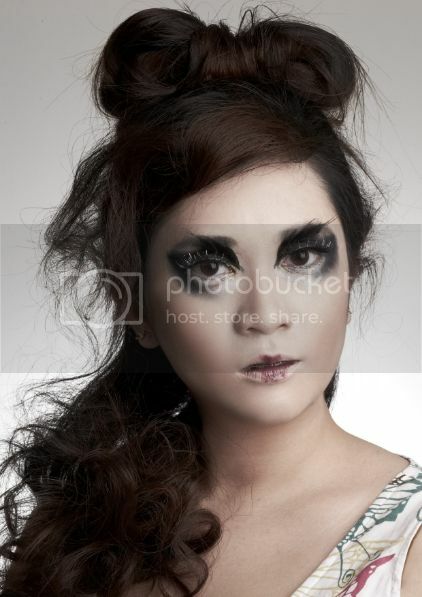 I also did a mohawk hair style on her to complement the make up. The sixth picture is an Era Look. I did a 1940/50’s Look on Aretha. The 1940 and 1950 make up is almost similar but there are still differences. 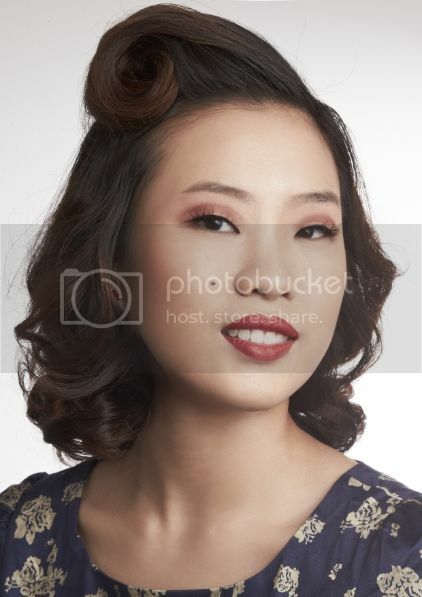 This makeup I did on Aretha is more of the 1940’s. However, her mole reminds everyone about Marilyn Monroe and many people thought I did a make up based on the 1950’s. So i concluded this look as the 1940/50’s Look. As for her hair, I did a victory roll. A week or two before the exam, I failed miserably in creating a perfect victory roll. But God is good, I managed to roll it on one try during the exam day and it was purrrrrfect! Lastly, the seventh picture is my favourite picture of all. This is the Stage Look. If you have read my previous post, I mentioned that I tried creating a look but have failed miserably. Actually, during the exam, I didn’t get to achieve that look I wanted to. She didn’t look the way I wanted her to look. For her hair, we saw a poster at either Miss Selfridge or Dorothy Perkins somewhere and Geraldine wanted me to do a ribbon hair on her. I agreed and yea, I didn’t practice doing that at all. It was spontaneously done on my exam day. And her hair was crazily layered, I had a tough time with her hair. Thank God, this look was meant to be messy. BUT…. when I received my portfolio, I was amazed at how the picture turned out to be! She looked fierce, not sad. She looked as if she just ate a rat. She looked….crazy… Though it wasn’t my teacher’s favourite, but I would say this is my favourite. Haha. My teacher even ask Geraldine why did she allow me to make her look so ugly. But, this ugly… is art! Oh well. This is just the beginning of a new journey. Thank you, The Make Up Room!